Today, Dr. Paley is Apollonia`s surgeon and our family’s hero. The day we met Dr. Paley I knew Apollonia would keep her leg. This story is likely just one of many that you will hear, but for our Italian-Canadian family living in Ottawa, Canada, it is a cherished one. When our daughter Apollonia was born with a leg that looked like a hockey stick our family’s lives were turned upside down. We proceeded to get diagnosis in Ottawa of clubfoot, then tibia vara. Apollonia wore corrective casts and splints for most of her baby and toddler life. In short, neither she nor we slept much and she didn’t get a chance to move around like a typical child. We went for multiple opinions and all prognoses were not good. They all stated that amputation would be the best option. One doctor read from an encyclopaedia to us – “tibial hemimelia is treated with amputation.” I thought, “How could that be? Apollonia who was jumping and running had to lose her leg?” It all was surreal. After not being able to function for about a week, we started to search the internet and that`s when my husband found Dr. Paley in Baltimore. We scheduled an appointment with him and travelled in terrible weather from Ottawa, Canada to Baltimore, U.S., for Apollonia`s life changing consult. Of course, with the support of incredible doctors in Canada who supported the consult and referred us to Dr. Paley. 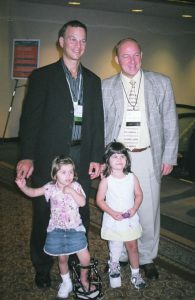 Our first encounter with Dr. Paley (2004) was a memorable one for our family. Dr. Paley, who is a mastermind in orthopaedics, changed Apollonia`s path that day. Both my husband and I were waiting in clinic with anxiety and anticipation for Dr. Paley to enter the room (Apollonia who was 2 and 4 months at the time was sitting watching a movie). When he finally did enter with an entourage of people (I guess students and other doctors were observing) I asked, “Dr. Paley - I know Apollonia’s option is to amputate but we are here to see if she has any other options.” I remember him looking at me very puzzled and then looking at Apollonia. He then turned to me and said, “Amputation would be absolutely ridiculous.” That day and that moment are forever embedded in my brain as the turning point for Apollonia. Dr. Paley then proceeded to lay out the plan for her treatment with confidence. We left that day with hope and faith that Apollonia`s leg would be saved. He has been Apollonia`s out-of-country surgeon since 2005 and her orthopaedic doctor since 2004. She is currently being treated for Tibia Hemimelia and her fixator was removed late in October of 2008. He gave us peace and hope in 2004 when all we had heard were scary prognoses such as amputation or major reconstructive surgery. Dr. Paley created a technique of treating Apollonia`s condition that was not only very functional but cosmetically pleasing. He quickly earned our respect and trust and we travelled from Ottawa, Canada bi-weekly for a better part of 7 months between 2005 – 2006 for treatments and bi-weekly for 8 months for her 2008/2009 treatment. As you can imagine, this is a large strain on a family financially, physically and emotionally. It is a lifestyle change but it is well worth it having Dr. Paley as Apollonia`s doctor. Dr. Paley works with Apollonia`s surgeon in Ottawa to monitor her progress. We know he always does what is best for Apollonia and our family. He stays on top of her progress and responds to us at any time with any questions or concerns. 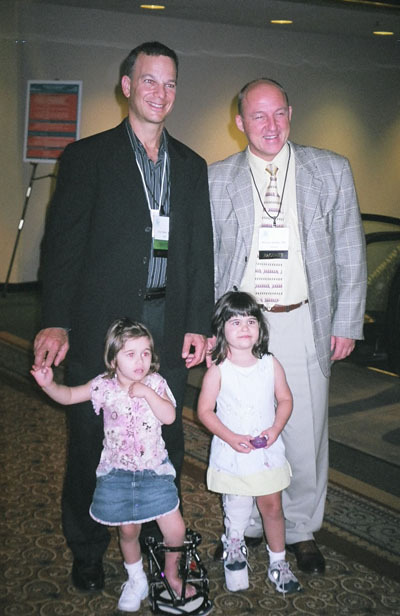 Dr. Paley is amazing with our daughter, and Apollonia (who is now 7) states that “only Dr. Paley can touch my leg”. 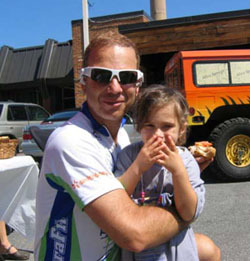 We call what he has done and will continue to do for our Apollonia a miracle. I would like to start this note by congratulating St. Mary's hospital and specifically the Paley Institute on being the worlds centre of excellence for limb lengthening and outstanding medical care for all limb deformities. My daughter is coming near the end of her treatment for the summer 2015 and I feel compelled to thank you and let you know about the excellent care that she received during our 3 month stay in Florida from St. Mary's Hospital and the Paley Institute. I would like to start by thanking the master mind behind the Paley Institute. My daughter Apollonia has been a patient of Dr. Paley since she was a baby. We followed him from Baltimore to Florida and would continue to follow him around the world to ensure our daughter receives the best treatment and outcome possible. Dr. Paley doesn't settle for "good enough" he wants all his patients including our Apollonia to have the best possible limb correction. It is very clear he has established high standards within the Paley Institute that are superior than any we have seen elsewhere. It is not uncommon to hear one of the staff say "I will do it this way because that is how Dr. Paley will want it". One of the most outstanding points is that Dr. Paley puts his patients as a priority over everything. This is clearly demonstrated when families have questions or concerns and he is responsive despite giving up his own personal time. Thanks to Dr. Paley we are forever grateful for your care of our daughter and we will continue to advocate this to anyone with limb needs. Thank you to the staff at the Paley Institute for their tremendous attention to detail and to providing excellent service and care. Caroline Eaton (program coordinator) is not only an outstanding support system to families as they arrive but she knows the ins & outs of the Paley Institute and advises immediately on patients next steps. Despite having the best care in the world this is a very difficult process and we are so thankful to have her help us through it. Her calm demeanour makes her a perfect fit for her role. I would like to thank Jennifer Scott, Marisol, all the staff in the office, June (in x-ray), Keisha (the nurse), the staff in physiotherapy and finally Luke (casts) for making Apollonia smile every time he put on a new cast. I am certain I missed someone but in short, we would like to thank them all. They work very efficiently and with standards that raise the bar on medical care. The PAs need a special thank you! All of them! Servando, John Robb, Marcia, Vera have provided excellent pre and post operative care. This is extremely important to families and often I get asked "how is post-op care?" when families call me for references from all over the world. I can say with high confidence that it is extremely responsive and of high quality. Often we found ourselves post surgery with issues and doubts on how to help Apollonia so we would call the on-call PA and would get the right action plan in place within a very short period of time. They are "WOW"! A doctor that deserves special mention and a personal thank you from our family is Dr. Packer. She is absolutely amazing. Her demeanour and kindness on top of her excellent medical skills differentiates her from many doctors we have encountered. Thanks to Dr. Packer you are an excellent addition to the Paley Institute and we are so happy to have had her care for Apollonia. Thank you to St. Mary's hospital for creating this infrastructure 6 + years ago, investing in the Paley Institute and allowing the best possible limb treatment for people around the world. As we pack up to head home to Canada I reflect on the last 3 months of care provided and wouldn't have wanted to have my beautiful angel girl be treated anywhere else. We will definitely need to be back but we know Apollonia is in the best possible hands with Dr. Paley and all your staff. Congrats to you for creating this centre of excellence and thank you again from our family Johnny, Franca, Antonio (brother) and especially Apollonia. Thank you Dr. Paley! Our family is forever grateful to you. Apollonia is the most grateful of all!